On Oliver Street, a road without a sign in the West End, lies a four-story brick building, which is the studio and home of divorced artist Marlene Steele, who has lived there since 1987. She often paints her neighborhood, which is inner city, urban and industrial. Steele chooses urbanscapes and people at work as her subjects. She moved into the West End when the area was a slum, and made friends with the neighbors, firefighters and cops, some of whom she has painted. Her family, the Von Handorfs, originally lived on Grandin Road in Hyde Park. They moved to Peaselburg neighborhood, steeped in German heritage, in Covington. Steele entertained herself with crayons and drawings as a child. Her father brought home crayons from work. Steele found a cigar box to collect assorted crayons. As early as nine-years-old, she knew she wanted to be an artist. A member of St. Augustine Church in Covington, she noticed the décor as an example of German-held values in art and church architecture, i.e., fine painting based on good draughtsmanship and composition, craft and coordination, and expansion of the color palette. She also remembers a Latin mass every day with Gregorian chant. She sang in the choir and looked at the realistic statuary. Steele recalls the Pieta, a sculpture of the Virgin Mary cradling the dead body of Jesus. It was the subject of one of her sketches in the western light. She transferred her membership to Covington’s Mother of God Church with five murals by Johann Schmitt, an early teacher of Frank Duveneck, and whose work is in the Vatican. The oldest German church in Northern Kentucky, Mother of God appealed to her as it houses a Pieta, resembling Michelangelo’s Pieta, a work of Renaissance sculpture displayed in St. Peter’s Basilica in Vatican City. She noticed the conveyance of death and mourning with a strong triangular composition. “I looked at the statues a lot,” she said. Then, she drew statues in pastel with light coming through the window. Steele graduated from Covington’s Notre Dame Academy in 1968. She remembers Sister Reina, an art teacher, who introduced her to collage and themed illustration in pencil, ink and watercolor. During junior and senior high school, she also studied with Covington portrait artist Aileen McCarthy, who taught her atelier techniques. Later, she received a certificate from the Art Academy of Cincinnati with dual majors in painting and drawing. Music formed her background as well. She sung such classics as Schubert’s Ave Maria. After high school and art school, she joined Mother of God choir. “Music adds to the energy when I try to paint,” she said, and helps her concentrate on her work. She keeps a series of Cincinnati Symphony Orchestra tickets and walks through an urban area to attend concerts at Music Hall. Early in her career, she worked at H. & S. Pogue Company as a sign painter under the direction of Paul Eschelman. He was the senior letterer and her brush lettering mentor. He gave her his quills when he retired. She had a studio at the Big Four building at 517 W. Third St. It burned down in 1987. Artists were out on the street. She saw an advertisement in the newspaper and bought the building at 430 Oliver St. It was a manufacturing site in a mixed use zone. Steele sanded the floors by hand. She recognized the nails, which were similar to the ones in her cigar box containing crayons. There were times the West End was a rough neighborhood with break-ins and crime. “One has to put this area into perspective,” she said. “You see a segment of the city that has not experienced positive relationships.” Movements existed, however, to improve community living. She has served as a member of the Dayton Street Neighborhood Association and the West End Business Association. The groups were both interested in increasing a level of safety and cleaning up the neighborhood. 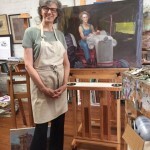 She made the decision to rent floors to other artists, recreating an atmosphere andM camaraderie she enjoyed at the Big Four building. “I’ve met so many artists as well as musicians. It’s validating to see people working today. I have always tried to have a studio in my professional life,” she said. Steele visits museums in town. She likes the oil on canvas painting of former President William Howard Taft created in 1909 by Joaquin Sorolla at the Taft Museum of Art. Another painting that appeals to her is The Cobbler’s Apprentice by Duveneck. “I admire the signature brushwork of both of these artists: their brush bravado is a hallmark of their painting contribution,” she said. “Sorolla paints an accomplished politician from a great Ohio family,” Steele said. “Duveneck immortalizes a nameless youth struggling with poverty, yet in his stare, a steely streetwise survival. These two paintings present the opposite poles of the social strata in mid-state America in their time. I can’t think of a better reason to paint a portrait. My painting The Busker is my answer to Duveneck’s Cobbler’s Apprentice,” she said. 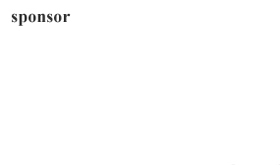 “I want to be a contemporary artist,” she said, however. Her art reflects urban living, not only in the West End, but also in the back alleys of Covington. “I like geometry and light, painting garages and old buildings.” She is drawn particularly to green, which appears on the wall of a building in one of her paintings called Garage with Green Shape, Covington. 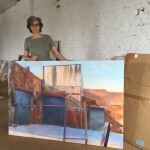 “My perception of the scenes which become landscapes in my body of work materialize from an involvement with geometric form and space in our everyday environment,’ Steele said. She had a recent show at Wash Park Art gallery, where I saw her urbanscapes as well as drawings from court cases. 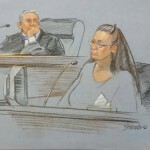 Local media pay her to capture images of lawyers, judges and defendants appearing in trials. 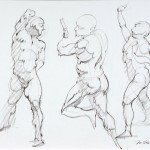 Steele advises young artists to draw a lot. “It will enhance any pursuit,” she said. She sees a resurgence of interest in the skill and craft of art. People want quality. “Put your heart into it,” she said. “I think education should never stop,” she said. Although digital art is an inevitable tool for an artist now, it is not to her taste. “People still need to be able to sketch,” said Steele. “I travel with a sketch book or camera,” she said, even though she is not a photographer. “I have been cultivating more friends here,” she said. Steele is a member of the Cincinnati Art Club where she enjoys drawing opportunities of portrait and figure from life and the camaraderie of friends in the effort. Steele is a signature member of CAC. Steele also became interested in calligraphy and co-founded the Greater Cincinnati Calligraphers’ Guild in 1980. Introduced at Summerfair, the Guild encourages members to explore and enjoy the spirit of the handwritten letter and related arts. Steele worked at Gibson Greetings, Inc. as the only calligrapher in the lettering department for nearly a decade. She is still producing freelance calligraphy work for corporate and private commissions today. Steele has displayed her work in The Ohio Governor’s Landscape Invitational Juried Exhibit from June, 2014 to June 2015. “Only by a sense of control is an image transposed into art. The ability to articulate feelings with the strokes of a brush and a combination of colors and shapes is like being entranced by a magical symphony,” she said. She also has developed a client base in recent years. Some clients remained with her during the lean years. 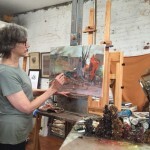 In addition to her commissions, studio seminars and exhibits, she has taught in the community program at the Art Academy of Cincinnati since 1995. “I find working with people to be a fascinating investigation as well as an artistic challenge, whatever the choice of media,” she said.